When I travel, I always like to bring back with me a new type of whisky I’ve not had before. Last week I returned back from Spain and luckily, our flight layover happened to be in London, so I got the chance to stop at their World of Whiskies duty free shop. It was as if I was a kid in a candy shop. I was able to bring back with me, a couple bottles of whisky to include the whisky I am writing about today, Mortlach Special Strength, which is sold exclusively at duty free shops. Mortlach was established in 1823 in the Speyside region of Dufftown. For many years Mortlach has been produced to be a vital ingredient for fine blended whiskies. As you can see, this is changing with Diageo launching Mortlach’s own single malt expressions. Mortlach is now producing four new whiskies under their liquid expressions. They are: Rare Old, Special Strength, 18-year-old and 25 year-old. For this Special Strength, Mortlach uses recharred ex-bourbon American oak casks and refill European Oak to mature the whisky. At the duty free, this no-age-statement whisky was priced at around 75 pounds. 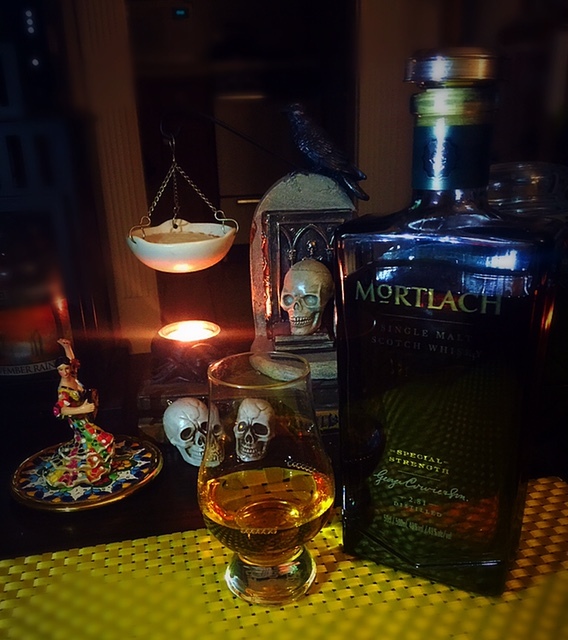 I never like to purchase whisky without knowing whether I will like it or not, however, this Mortlach Special Strength happened to be one of the whiskies they were sampling that day. I was lucky to have the chance to try it before buying and obviously you know by now how that story ends. This is by far the creamiest whiskies I have ever tasted. It is delightful and full of surprises. As I am not a fan of sweet drinks and there is sweetness to this whisky, but not to the point where that sweetness is overpowering. The sweet and spice notes come together to perfectly harmonize and balance this whisky. I am extremely happy with my purchase and would definitely recommend trying. If you were looking for a smooth creamy whisky, then this would be that whisky. It is silky, smooth and very much like ice cream. Perfect to have after a nice meal. Im a huge fan of the Mortlach 16 that was recently discontinued. Not got round to trying the new range of Mortlachs yet. People seem to be saying good things about them however. I never got a chance to taste the 16 yo. Such a bummer it’s discontinued now. This was my first time trying something from their new range. I was definitely very pleased with it. If the others are just as good, then I am looking forward to exploring the other expressions in the range. Cheers!